Jared Unzipped: That's Just FAN-tastic! I've lived in my current home for four years. Crystal and I purchased it in June of 2011. In that time, my office has gone without a ceiling fan. It had the hook-ups and wiring pre-installed for a fan, but for some reason one was never put in. Today, I was determined to change all that. After looking at the wires that were present in the ceiling, we trotted down to Lowe's and purchased a brand new ceiling fan for $50. Nothing fancy or extravagant -- just something to get the job done. "Why did I wait so long to install this fan? I'm an idiot." When Crystal and I finished, I asked her as to why I waited so long to tackle such an apparently easy project. She explained that I lacked confidence in my own abilities for many years, only having recently come to understand how able-bodied and inherently talented I am. Crystal also said that I should continue to believe in myself and not fear future projects. I think she's right. For far too long, I doubted myself and what I could do. These past few years have been a really healthy period for me. Every step of the way, I'm improving and becoming a more whole human being. It's like I'm earning back the pieces of myself that I gave away over the course of twenty plus years. 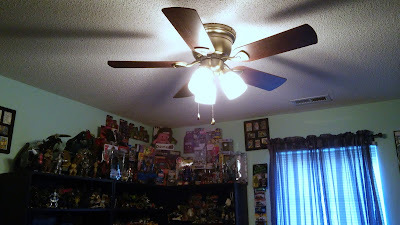 Every time I look at that ceiling fan, I'll feel a bit of pride. The funny part? We're thinking about moving in a year. I really should have installed the fan a long time ago so I'd get to enjoy it more!